July 8, 2015 By Allyson 16 Comments This post may contain affiliate links. Read my disclosure policy. For the last 2 years or so, my husband and I have a great Sunday night tradition – Jalapeno Ranch Black Bean Loaded nachos. Now, we don’t eat them every Sunday, but when we do, it’s a joyous evening. We started making them when we would watch Game of Thrones on Sunday night, and it slowly became our thing. When I was pregnant last year, nothing was getting between me and my Sunday night nachos, but now in the last year or so, it’s not such a regular occurrence. However, when I do make nachos, I do it right. Layer upon layer of chips covered in delicious cheese and fresh ingredients. When I was putting together this post, I knew I had to step up my game…so in came the Jalapeno Ranch. Jalapeno Ranch is awesomely delicious, and I knew putting it on top of these nachos would be a hit. 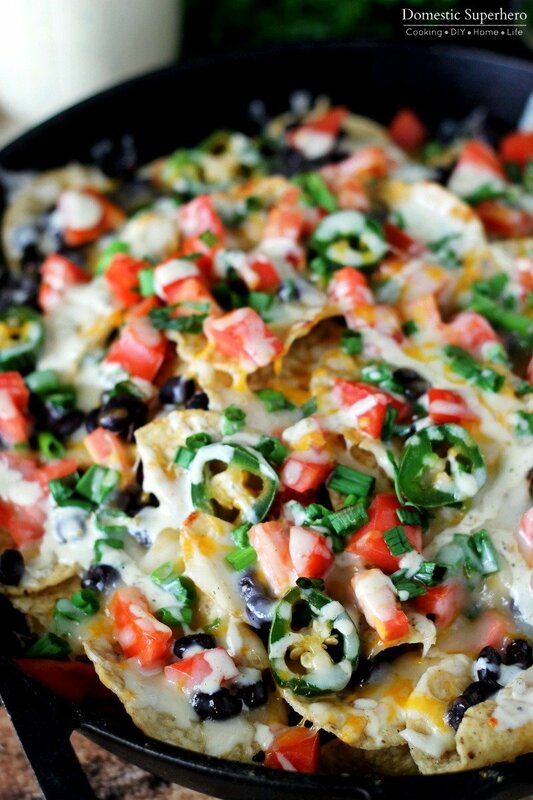 Of course, everyone loved the Jalapeno Ranch Black Bean Loaded Nachos. smothered in 2 different types of cheese and black black beans. Then, as if not already delicious, the jalapeno ranch is drizzled (or dumped, whichever you prefer) on top, and seriously takes it to the next level. Place all ingredients into a blender or food processor, and pulse until smooth. Refrigerate at least 2 hours (longer better), and then serve. These Jalapeno Ranch Black Bean Loaded Nachos are totally vegetarian, so great for a meatless Monday or party dish. If you absolutely cannot go without the meat, add some shredded chicken, it would be great with these ingredients. Baking nachos in a cast iron skillet really helps keep them warm longer, and it is a cute way to serve them – cast iron is all the rage these days. Definitely make these when you have at least a few people who are around to eat them, otherwise, you may end up eating them all- they are that good. 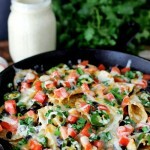 Jalapeno Ranch Black Bean Loaded Nachos are full of fresh ingredients and homemade spicy jalapeno ranch. In less than 20 minutes you have the perfect dish! Heat oven to 425 degrees F. Place beans in a microwave safe bowl and cook for 1 minutes, stirring after 30 seconds. Using a baking sheet or large cast iron skillet, add a thin layer of chips to cover the bottom of the pan. Sprinkle about 1/4 cup of each cheese on top. Add 1/3 of the beans. Add another layer of chips, 1/4 cup of each cheese, 1/3 of the beans, and 1/2 of the tomatoes. Add another layer of chips (this is the top layer), 1/4 cup of each cheese, the remaining beans, tomatoes, jalapenos, and half of the green onions. Cover the top with the remaining cheese and green onions. Place in oven and bake for 8-12 minutes, or until cheese is melted and chips are starting to slightly brown. Remove from oven and top with jalapeno ranch. Serve immediately. If you do add chicken to this, I would add it with the layers, probably under the cheese (this helps it stick to the chips). These look incredible! Jalapeno’s are my favourite! Nachos are a great Sunday night tradition, as is watching Game of Thrones! These look perfect and I love that they are vegetarian! Great recipe, Allyson! 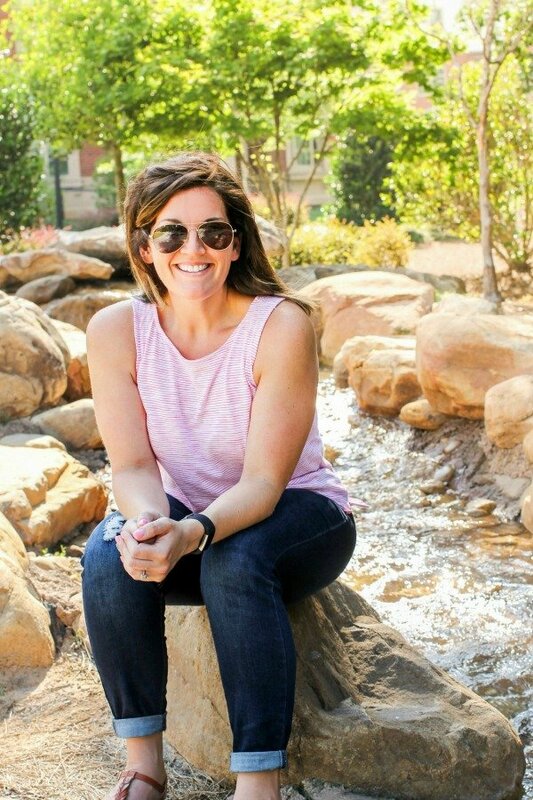 Thanks so much, Julie! I completely agree, 100%! Those look fantastic, craving a big plate of them now! 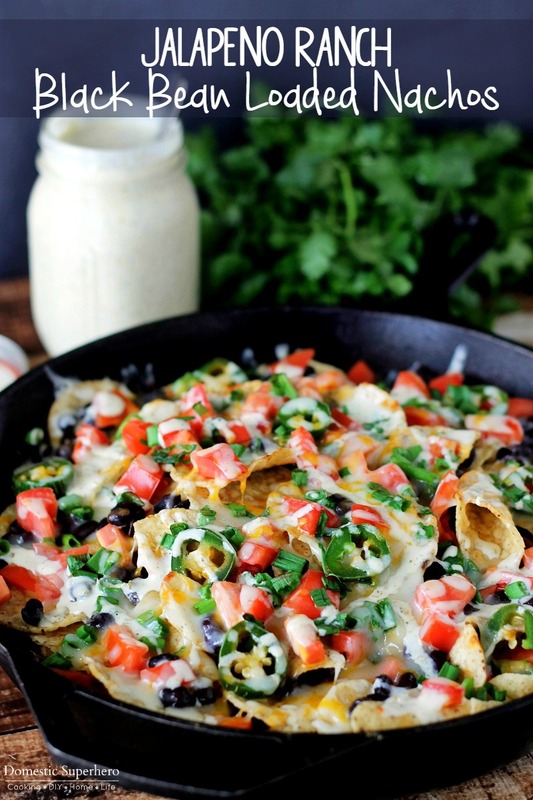 I need to try this nachos immediately, it looks so good! 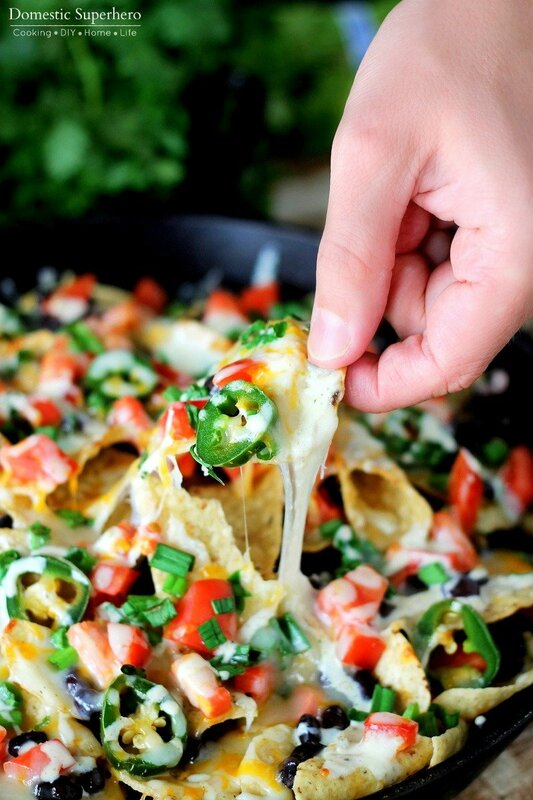 Okay now I want nachos! These look and sound so good!